It’s been a long time coming, but Genesis is finally launching its first-ever SUV, which should help boost the luxury automaker’s sales considerably. Previewed by a , the GV80 is expected to go on sale in 2020. We’ve already seen , but this render posted by gives us a better idea what the GV80 will look like when the covers come off. We can only hope the production model will look as good as this. The rendered SUV’s sharp styling takes its cues from the gorgeous GV80 concept but adds production elements from the G70, G80, and new G90 sedan including sleek LED headlights, a triangular grille, and high-spoke wheels that give the SUV a premium look that matches the design language of current cars offered by Genesis. At the back, a single light bar links the two LED brake lights and is surrounded by lots of silver trim. If it looks anything like this, the GV80's gorgeous design should help it stand out in the crowded luxury SUV segment. 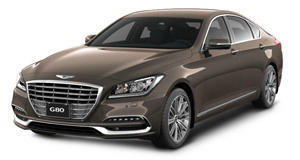 When it debuts, the production Genesis GV80 will share its platform with the G80 sedan. This means it will be available in both rear- and all-wheel-drive configurations, with engine options likely to include a 3.8-liter V6, a twin-turbo 3.3-liter six, and a 5.0-liter V8. Technical details are still being kept under wraps, but the high-performance G80 Sport produces 365 horsepower. While the GV80 isn’t expected to go on sale until 2020, we could see the luxury SUV debut later this year. Expect it to cost more than the , which starts at $42,050. After the mid-size GV80 launches, a smaller GV70 is expected to follow as a rival to the BMW X3, Audi Q5, and Mercedes GLC.